As a landlord or property manager, you’re responsible for securing repair, extermination and a slew of other services for tenants, all included in their regular payments. Why not provide a service that can help you generate extra revenue like Internet & WiFi for apartment complexes? Take it from us, WiFi and Internet is a valuable commodity. Just think of the growing number of household appliances that rely on strong WiFi connections to function. If you’re allowing traditional Internet and cable providers to bill your tenants for such services, you’re missing-out on hundreds of thousands of dollars in annual revenue by not offering this service directly. Newer buildings that are under construction should especially be aware of this unique service and the vast benefits that it can provide both to building management and its tenants. A managed WiFi and Internet provider can help you become the Internet services provider (ISP) who offers valued tenants a higher level of Internet and dedicated support. Installing WiFi for apartment complexes doesn’t have to be difficult. We will do work for your apartment complex, condominium, or other multi-tenant unit that yields a profit every single month! Keep reading to learn the logistics of this arrangement and why tenants will be on board. Providing Internet and WiFi for apartment complexes is a, well, complex undertaking. It requires you to anticipate and accommodate units with unique equipment types and configurations. Expertise and experience are required to engineer a robust WiFi system that satisfies each tenant’s needs. That’s why it’s important to partner with a trusted WiFi provider. You manage a multi-tenant property, after all. We don’t expect you to manage the network as well. When prospective tenants view your apartment complex, they are looking for ways in which it differs from similarly priced options in the surrounding area. You work hard to ensure that your complex is unique. You can’t support a one-of-a-kind multi-tenant property with one-size-fits-all WiFi network equipment. 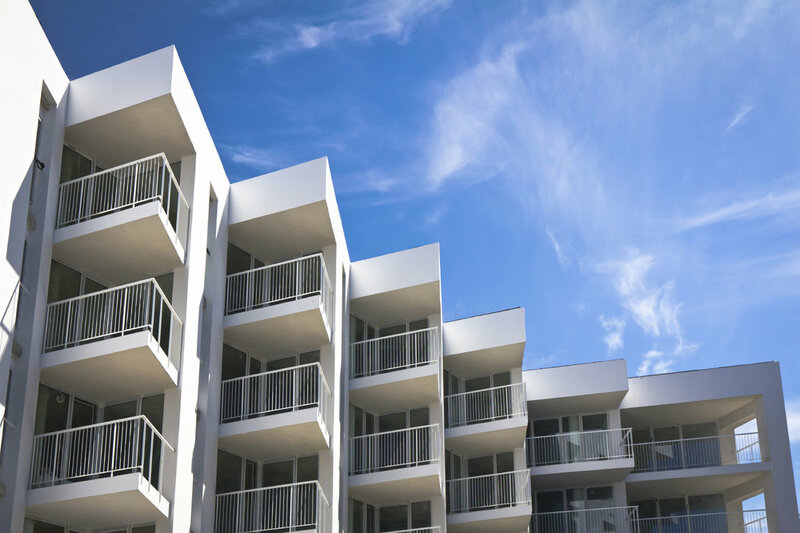 WiFi systems for apartment complexes should be designed to support thousands of simultaneous devices, allow for high-speed throughput and scale to meet tenants’ various needs. Learn more about wireless network installation services. When providing a residential building with Internet, you want enough to support your tenants, while ensuring that you are not overpaying for a pipe larger than you need. This delicate balance is achieved through proper management and reporting. Proper management and reporting is easier said than done. We see apartment complexes and competitors get it wrong all the time. A quality WiFi service provider has the equipment and expertise to determine how to best distribute bandwidth to your tenants. Technical difficulties happen. Whether the cause is device, user, or system related, a professional service provider will handle anything your tenants throw at them with a calm demeanor and a knowledgeable response. When it comes to providing WiFi services for apartment complexes, customer support has to meet and even exceed that of major ISPs. After all, you want to build long-term and lucrative associations with your tenants. Those who occupy your hotel, apartment complex, or student dormitory may have concerns about WiFi security. This is totally normal when it comes to providing WiFi for apartment complexes and multi-tenant units. When thousands of individual connections are being managed by a single WiFi system, how do you deliver the type of network security that you would find in your own home or office network? A VLAN, or virtual local area network, is assigned to every device connecting to your managed WiFi system. The device’s VLAN separates it from network traffic, preventing it from communicating with other devices on the network. What about tenants who own multiple smart devices, like wireless printers, hard drives and lighting systems that communicate with one another? Don’t worry, we’ve thought of them, too. Such devices can occupy a shared VLAN, so that they can communicate with one another but not with unauthorized devices belonging to other tenants. Tenants aren’t the only ones with security concerns. When you’re an ISP, you’re responsible for upholding the integrity of your network environment. One threat to watch out for is peer-to-peer file sharing.Peer-to-peer file sharing services pose a grave danger to network operators in multi-dwelling units, such as apartments or student dormitories. Penalties can take the form of financial forfeiture and even complete network blackout periods. While it’s impossible to control end user behavior, it is possible to implement network limitations to deter tenants from illegally sharing files. For example, you can opt to have your network configured so that Internet speed slows to a crawl for those engaging in illegal activities. Looking for a more passive solution? Trigger a notification to appear on the end user’s device that will warn them to cease any illegal file sharing activities before further disciplinary action is taken. In most cases, a simple warning will be a cue for most pirates to stop. The pirates may stop, but they remain on your radar. A full record of the end user’s account information and unique device address, as well as the amount of data transferred and any additional details is automatically logged to help you resolve any potential issues and satisfy requests from ISPs or law enforcement officials. Flexible Bandwidth – Whether your tenants need a 10mbps connection for basic Internet or dedicated speeds of 1gbps+, Made By WiFi has you covered. Bandwidth is flexible, it does not require a long-term commitment and it comes in a variety of packages to fit all needs. 24/7 Customer Phone Support – If your tenants have an issue, they can reach-out to our US-based customer support team for immediate resolution, any time. Exceptional Onsite Support – Some issues can’t be resolved remotely and we may have to come onsite to make an accurate diagnosis or provide a more complex solution. Whether we’re working in a server room, a hallway or in a tenant’s apartment, we always treat our work space with the utmost respect. Customer Onboarding – You may offer tenants WiFi, but that doesn’t mean that you have to pitch services or onboard new customers. Made By WiFi is happy to do that work for you! We offer a variety of marketing materials and can activate services in-person, online or over the phone. Seamless Installations – Our team will manage every element of your network installation from design to engineering to configuration. Regular Maintenance – Even the best equipment needs to be enhanced occasionally. From software upgrades to hot-spare swap-outs, our team is flexible and willing to work during the early morning hours to make sure end users never experience any network downtime. You may be thinking, “my tenants can already purchase Internet on their own, why do I need this service?” The answer lies in the service delivery. Sure, anyone can call any of the major ISPs and sign-up for their own contract, but large corporations lack the attention and dedicated technical knowledge that a niche service provider, like Made By WiFi, offers. Work with us and grant tenants the option of a personalized plan that includes ‘round the clock support. No matter the type of multi-dwelling unit you own or manage, your tenants are growing increasingly reliant on Internet services. They’ll be eager to deal with a service provider with a product catalog that goes beyond what can be purchased from a traditional ISP—all at a competitive price, in a flexible service package. Earn extra monthly revenue for every door/account, all while increasing tenant satisfaction. Two bedrooms, one bath, flexible, affordable WiFi for apartment complexes and MDU buildings. In the Digital Age, that’s a great way to ensure that prospects give your listings a double take. Partnering with a wireless service provider to offer managed Internet in your apartment complex is not only a surefire way to attract tech-savvy tenants. It is a great strategy for retaining existing tenants and reducing turnover. Tenants sick of feeling locked into long-term contracts will appreciate the flexibility you can offer. They can purchase service on a monthly basis, as they need it. Tenants will also appreciate the low price. Since we purchase bandwidth and networking equipment in bulk, we can offer services at much lower costs with much quicker delivery. Tenants can literally purchase service on their mobile devices and have Internet ready for use as soon as they enter their property. The benefits don’t end there. Tenants will no longer have to be their own IT support and will experience minimal wait times for on-site installations and service. After all, properties with similar services are hard to find. By utilizing a managed WiFi service for your residential building, condo complex or student dormitory you separate yourself from the internal politics of traditional internet service providers that often underpay their technicians and sacrifice quality of service in exchange for larger salaries for the high-ranking executives. You no longer have to worry about vandalized fiber cables and interruptions of service because of disgruntled technicians trying to prove a point to someone. Providing managed WiFi and Internet is an excellent way to attract new tenants, retain current ones and realize untapped revenue potential. Adopting the responsibilities of an ISP may sound like a huge undertaking, but it’s a piece of cake when you partner with Made By WiFi. The process is simple and seamless and you’ll be left wondering why never explored this option before. Whether you’re a building owner looking to create additional value in your apartment complex through new amenities or the manager of a college dormitory looking for a secure network for students to use, we have the solution for you. Our team possesses over 15 years of experience installing WiFi systems for apartment complexes, condos and other multi-dwelling units. We will market, activate, monitor and maintain WiFi and Internet services. All you have to do is say, “yes”, sit back and collect the extra revenue. Call Made By WiFi today to learn how you can increase the value of your apartment complex or multi-dwelling property by partnering to offer managed WiFi and Internet services.